Sensebellum can design, create, install, perform, and do pretty much anything. Between monuments, festivals, natural features, private events and more, we've made all sorts of different architecture and objects come to life with custom designed visual content! Every project presents a new challenge and calls for something different. Getting the job done right often requires us to brainstorm and engineer custom pieces of hardware ranging from circuit boards to weather proof projector enclosures. 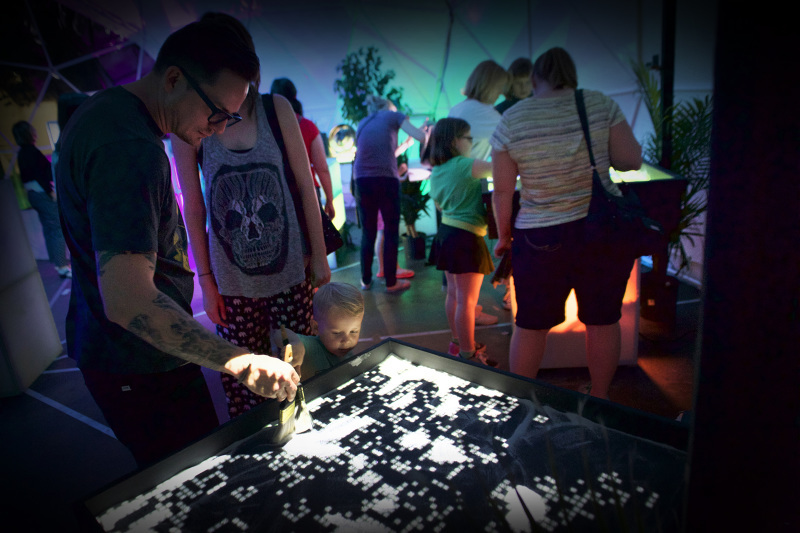 We are constantly creating new multi-sensory experiences showcasing a wide range of emerging technologies in the form of art pieces that are not complete until you play with them! The artistic community is a rapidly evolving and innovating landscape full of creative people. Collaborating and sharing remain at the core of what we do. We help many artists design projects such as community improvements and cutting edge art installations. Projection mapping, LED features, flood lights, moving lights, lasers, and more with our custom engineered CUBIX modular staging system, we are able to achieve nearly limitless possibilities. We are constantly taking on new challenges and endeavors pushing the limits of what we can do by blending together technology and art. Every day and every project is different. If you're excited about a new idea or project, please feel free to contact us! Every project starts with an idea. This is where we determine the objective and the constraints by working together with other teams and among ourselves to determine what is going to be most effective. Next comes tracking down the materials and crafting them into the right specifications using techniques ranging from wood working to soldering, 3D printing, and beyond. To finally bring these ideas to life we integrate technology often incorporating custom written code or custom made electronics. Finally, we go live with the project! If it is an event, we stay present and work with the staff to ensure everything goes perfectly. If it is a permanent installation we make sure that we leave those in charge of the project with all the tools and understanding they will need to successfully operate and troubleshoot while remaining as a continued resource for them. Sensebellum is the space where the senses combine in the cerebellum to expand our ability to perceive and understand the world around us. My company creates new sensory possibilities through technology and meaningful artistic expression. We deliver these experiences to as many people as possible so as to inspire interest in the world around us and create the best future possible. "Starting with a life long fascination in electronics, a love for the wilderness, and a keen eye towards the future I have felt compelled to explore these areas of digital and natural. Always curious to combine them into unique, yet useful forms. Thank you for your time and interest in Sensebellum. To receive a quote or submit an inquiry please fill out the form and we will be in touch as soon as possible.